Power Stock Trading Strategies 2.0 - Trading Concepts, Inc.	Power Stock Trading Strategies 2.0 - Trading Concepts, Inc.
Hi, my name is Todd Mitchell, founder and CEO of one of the oldest (since 1994) and most respected trading education companies in the ​industry. I don't predict the market. I don't care what analysts say. And I don't pay close attention to the news. So why would million-dollar market makers and Wall Street pros call upon me to help them improve their trading results? I've helped so-called "celebrity traders" - names you may recognize - including a man who is now the head portfolio manager of one of North America's largest billion-dollar hedge funds. They call me because, unlike a lot of what you read about today, my entire approach to trading is driven by - first and foremost - protecting your capital. And secondly, only after we teach you how to keep your money, we'll show you how to grow your money as fast as possible. ...The opposite of how most people trade. I need you to stop everything you're doing right now. Close down your email and any other distractions you might have, and focus on this important ​letter for a moment. It really could be the most profitable decision you make this year...I'm not kidding. you must do things differently from the crowd." - if they only knew how easy trading really was..."
​That's why I'm talking with you today - to discuss a different way of looking at the opportunities that exist in the stock market today. Here's the truth: 98% of all stock traders fall into two categories. Or they're not making as much money as they could because they're missing a few critical ingredients that only a few traders have been using, which we'll cover in this presentation. Let's take a look at a chart of the markets prior to the year 2000. As you can see, you had a pretty consistent upward bias in the market - you could get away with being an average trader and still get pretty decent returns. You didn't have to worry too much about timing the best entry. Or using smart, position sizing strategies for maximizing your upside. Millions of people saw their wealth increase inside of mutual funds, IRAs / 401ks, company options, etc. But ​As ​It ​Turns ​Out, ​When ​You ​Look ​At ​Your ​Trading ​Accounts, ​Chances ​Are ​You ​Noticed ​Everything ​Changed ​For ​You ​In January 2000. And ​as you recall the market practically went straight up from 2013 to September 21st 2018, with very minor pullbacks of less than 10%. Then we finally saw a market decline of about a 20% ​from September 21st 2018 to December 26th 2018. 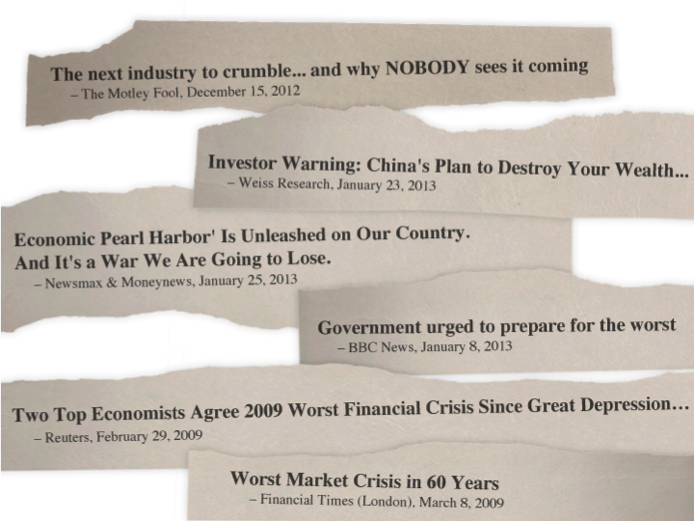 And of course we have seen throughout the years stories like the one's below that do nothing but try to scare people from trading and investing in the markets. "You ​Get ​Recessions, ​You ​Have ​Stock ​Market ​Declines. If ​You ​Don't ​Understand ​That's ​Going ​To ​Happen, ​Then ​You're ​Not ​Ready, ​You ​Won't ​Do ​Well ​In ​The ​Markets." Sure, while everyone else makes money when the markets are going up, the rubber really hits the road when the markets trade sideways or downward. Look, there are people who can teach you how to build a house swinging a good old fashion hammer and nail. This is about doing it with a nail gun. Making money faster, safer, and more efficiently. Knowing how to best use the tools available to you to maximize your profits - like knowing when to use very basic Options trades to turn your stock trading into a virtual ATM. Look, this isn't some sort of strategy I made up out of thin air. These strategies are what I've been using since I started trading. The only difference is how I took the same strategies I've been trading all along, and added ways to quickly scan a stock, lower my risk, and find more ways to make money - instead of waiting for the position to hit my limit. "...it totally focused my analysis of the market; at best, it has helped change my life!" "Thanks Todd, and by the way, I have made more money in the last two months than I usually make in a year!" "Someone must have switched on the light!!!!!!" Now I could go on, but this really isn't about how well my students are doing. the past few weeks than in all the years prior!!" ​ ​& ​How ​YOU ​Can ​Do ​It ​Too! Now, this presentation is for people who want to make money trading stocks (or options are any other tradeable market that can be charted). Most of the stock trading strategies we use are designed for the swing trader, holding a trade anywhere from ​three days, all the way to a few weeks. But the same rules apply to every time-frame. Except I don't want you to buy your stocks for the same price that everyone else is paying. Cutting your risk in half and immediately increasing your profit potential. ...and why you should be too. And I'll do one better...I'm putting my money where my mouth is and guaranteeing that this approach will make a difference in your trading. So, today I have a special invitation for you - it's one of those "fork in the road" moments where you have to make a decision to continue on the road you're currently on... or take a new road with me by your side. I'm ​Going ​To ​Be ​Personally ​Involved ​In ​Your ​Success - ​In ​A ​New ​Way, ​A ​Way I've ​Never ​Been ​Before. This is the only program available where you not only get direct, unlimited access to me - but you'll also get backdoor access. That's a professional mentor working with you to help you succeed. Now, while I can't guarantee how much longer this will last - if you get in now, we'll grandfather you in to get ​UNLIMITED ​Access to the me for LIFE! I'm not pulling your leg. If you accept this invitation, you will be one of the few people given my direct line and personal email address to ask me any questions you have about trading the stock market. Can ​You ​Imagine ​What ​This ​Kind ​Of ​Insider ​Help ​Can ​Do ​For ​Your ​Future? Look, I wish there had been a service like this when I started. But until you've created a name for yourself, getting a professional trader to take your calls is nearly impossible. Having a program like this would have saved me from a lot of agony and stress. Plus a ton of money: at least $1.1 million - maybe more. That doesn't even take into consideration the years it would have saved me to get to this level. Again, because of this intensely personal service, only a handful of people will get in. And I hope you will be one of them. Oh, and if you are worried about the price, relax. It is far less than what this kind of service usually costs. I guarantee it. However, I simply want to give you wall the facts before you jump right in. First, you get ​Personal, ​Unlimited access to me. As tempting as it may be to email me your portfolio for comments, I wouldn't do it yet if I were you. To ​Make ​You ​A ​Better, More Consistently Profitable ​Trader & ​Investor ​In ​ ANY ​Market! So before you and I talk, I recommend you go through this ​comprehensive, A-Z training program. Because if you follow it through, you'll be able ask me much more valuable questions than you would without this knowledge. And naturally, my answers will be more valuable to you for the same reason. I might add, there are two more professional full-time traders that helped me compile this powerful trading program. ​Combined, all three of us have over 50 years of real-life, 'in the trenches' market experience that you wouldn't be able to get anywhere else! That's why this really could be your first - and last - chance to get in. ​However, lucky for you and me, you can approach the market with an unfair advantage. Quite simply, I had one goal when I started to pull this together from our years of personal experience. To make this the last ​trading course you will ever need. Now I have to honest with you: this information is out there. But it took years of real-life testing, tweaking, and perfecting to determine the difference between what actually works and what is fluff. You see, most firms sell you bits of information - then up-sell you more and more. But no one has ever pulled it all together for you as a trader and investor in a step-by-step process for consistent trading results. And certainly not with this level of personal service - at such a low price. Each module has simple videos, text, and tools you can watch as many times as you want. ​YOU HAVE UNLIMITED LIFETIME ACCESS! ​One of our many combined specialties is ​options and how to protect your stocks with them - turning ordinary traders into professional-level traders like several of the so-called "celebrity" traders ​we have mentored in the past. As crazy as it may sound, you can really start from zero and become a full-time trader quite quickly..
Of course, that's if you know what you are doing, and have the patience and discipline to stick with it. That's ​Why I've ​Agreed ​To ​Be ​Your ​Personal ​Mentor ​& ​Give ​You ​ ​UNLIMITED ​Access ​To ​Me. ...or if you simply want to make sure your retirement money works today and in the future - so you don't have to. I know this may sound too good to be true. #1: A 39-step treasure map to wealth. #2: The personal, day-to-day companionship ​of knowing you can call or email us any questions you want. We have all been where you are - and climbed to success. This unique program tells you how you can do it too. Success is a path. The question is, will you follow it? While many would be thrilled to get this complete map, you get much more. We will literally carry you to the top if you let us. The catch is: this is only open to the first few people who join because we have a life outside of teaching (like trading for ourselves); therefore, our time is limited. But look, if you are serious about trading successfully, don't wait or you'll miss out. Inside this Power Stock Mentoring Program, ​we teach you ​various simple and easy to implement strategies revealing how you can trade with 67% odds of success​, even if you knew nothing at all about the market. More than double the average! While it sounds unbelievable - and takes some time to learn - it can be learned. And once mastered, it's fairly easy. ​We've created an invaluable tool showing how to time your trades better while giving you unmistakable buy and sell signals in seconds. And unlike people, it doesn't stress under pressure - so you can count on it no matter what. You may ask, Why ​aren't we retired if ​we're experts? Well, ​we love trading​ so much that we don't ever plan on retiring from trading the markets. In fact, once you retire from your full-time job, you may find that making money trading is much more fun than watching Star Trek reruns all day on TV. Like we mentioned earlier, this program is extremely comprehensive. That's why it best unfolds when you take the first step. Remember: ​We ​Are ​With ​You ​At ​Every ​Single ​Milestone ​Along ​The ​Way. ​​We are living proof because ​we used to be students just like you. In fact, because you managed to ​read this far, you know this is not a get-rich-quick scheme and a real mentoring program requiring both study and work from you. And if a little elbow grease doesn't scare you, you're already halfway to what it takes to succeed as a trader and investor. It's really about two fundamentals: the willingness to learn and patience. But there is a third element to success: ACTION. Even the most priceless knowledge is useless without it. And if you are patient, but fail to act when the opportunity comes, you'll fail - no matter how smart you are. That's why each step of the Power Stock Trading Strategies Mentoring Program equips you to make quick, easy, and fast decisions so you don't miss out on these trades. You see, what makes this program truly unique is its totality. We simply combined decades of REAL LIVE TRADES, testing, tweaking, and perfecting our trading and experience into one mentoring program. For example, ​we're going to teach you how to "directionally trade" stocks, or any market you choose to trade.. PLUS...I will give you our secret weapon...The Market Flow Analysis Method. It's a simple ​FORMULA that pinpoints for you accurately when a trend ends and begins - early on - not after the fact! You ​Will NEVER ​Look ​At ​A ​Chart ​The ​Same ​Way ​Again...I ​GUARANTEE ​It. In fact, it makes getting caught on the wrong side of the trend almost impossible. This alone could increase your consistency by 64% or greater. There's also a level where I reveal how big institutional traders and hedge fund managers really think and look at information. This comes from my personal experience. If you know how to "read their inside moves," you can make money consistently by following their patterns. And you will not learn it in any school. Because until recently, this has been known only by a handful of the best traders on Wall Street. It will be only available to you if you join me. And MUCH more...waiting for you in our secret online vault! You will get access instantly if you accept this invitation now. ​The Power Stock Mentoring Program only has one purpose: To make you money in ​ANY ​Market. No matter who the President is, or what the government does. If you were to hire me, you're looking at $​10,000 dollars a day, and I'd argue that's still a bargain. If you take advantage of this invitation today, all I ask is 6 payments of $497. Now look, this service is for serious traders and investors only, and if a small investment of $497 a month for 6 months scares you, this is ​NOT for you. Heck, if we could help you earn just an extra 1% each month for the next 10 years, a mere $10,000 investment would compound to a whopping $33,000. At 2%, it would be over $107,000! If you put this program to the test, take advantage of all the support I am making available to you and - at the end of 1 year - you're not convinced this program has paved a new, consistent, and more successful road for your financial future, just show me that you took this program seriously (and not just let it sit dormant and collect dust), and I'll rush you your money back. All of it. PLUS, I'll give you an extra $500 just to putting your faith in me. After mentoring over ​50,000 traders worldwide from all levels of experience, I can give you this type of guarantee because that's how confident I am that we can help you. And your program is 100% tax-deductible if it's used for business. All you have to do to get started is click the button below while it's still available. You'll also get a free bonus titled: How to Become a Full-time Trader, which will be waiting for you once you go through the levels we talked about. Also, ​we recorded and archived 8 "firepower" webinars to boost your trading profits and answer any additional questions you have. And they aren't sales pitches or anything like that, but real training filled with proven knowledge. And like I said, you have a 365-day, 100% performance money back guarantee. If you take this course seriously, you simply can't lose one red cent. This is the only trade on earth where I happily take all the risk - because I believe in this so much. 1. Radar Screen for use on Tradestation to help you identify opportunities in under 4 minutes (but even if you don’t have Tradestation, we’ll show you how you can identify opportunities using your own broker’s tools). Plus, 3 Software Programs I created specifically for my own trading that I want to give you. They work on Tradestation, NinjaTrader, MultiCharts, and MetaTrader. Your lifetime access to this software shows trends and power action zones for highly probable entries and exits. 2. The TCI Trend™ Software based on the famous Market Flow Analysis Method that I created in 1992. And you can use this software for all markets you trade. 3. The TCI Power Action Zones™ Software will help give you precise entries into the market while enabling you to keep your protective stops close, while making necessary adjustments based on the volatility of the stock you’re trading. 4. The TCI Floor Pivots™ Software that automatically plots very powerful support and resistance levels on your charts, so you don’t have to calculate these manually if you chose to use this information to day trade. Of course, none of the software programs we created are based on any “blackbox” or “secret” algorithm that will remain hidden from you. You’ll know exactly how they are created and why…. And the truth is that you don’t even need the software to be successful, but I created it as both a time saving tool, and to serve as a checks-and-balance resource to make sure you’re making the best decision. 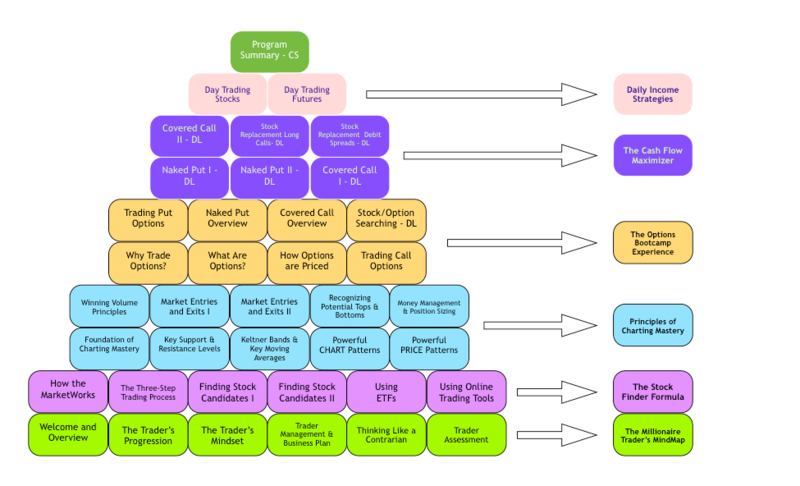 ​Of course, if anything is not crystal clear to you - as a Power Stock trading student, you can pick up the phone and call ​us with questions about "how" and "why" we made certain decisions. And in addition to ​everything I mentioned above, you'll also get your FREE presentation on How to Become a Full-Time Trader. It helps you make smarter decisions for your retirement portfolio, too. The value of your FREE gifts is more than $3,458. Plus, the secret weapon: The Market Flow Analysis Method. "It's invaluable," as one serious trader commented. But you really can't put a price tag on the personal advice we give, can you? However, few can get in. Few can realize the security you only get from financial independence. You can if you resolve to join us. Remember, you have nothing to lose - and truly everything to gain. Let us prove to you that the markets still represent financial opportunity regardless of the economy. The button is below. Simply click it now. I'll see you on the other side and I want to personally ​THANK YOU for reading this.